I generally get started with my spring cleaning by going through the clutter in my house, getting rid of things I don't need, and packing away the winter stuff. That way, there is less in the way when I clean. Let's skip that for now, and go right to the cleaning. I give everything in my house an intense deep clean. Now, that may sound like you will be cleaning from the time the first crocus blooms to the end of Memorial Day, but I promise, it's not that bad. If you tackle one project at a time, or one room at a time, you will be done in no time, and it won't seem that bad. I like to start in the kitchen, because that is the room that tends to take the most time. Thankfully, not a lot of clutter accumulates here, but before I clean, I like to go through the cabinets, and get rid of things I don't use or don't need, like those plastic storage containers that tend to accumulate no matter what I do. Having tackled that, I start from the top and work my way down. Dust the Ceiling: Yes, I said dust the ceiling. Unfortunately, I have popcorn ceilings throughout my house, and they tend to collect dust. I take my broom and brush it across the ceilings throughout the whole house. Yes, some of the popcorn ceiling bits fall off, but since I want to get rid of it anyway, I could really care less. This gets rid of the dust, and the cobwebs that collect there. Wash the Walls: This is pretty self-explanatory. I fill a bucket with warm water, a little dish soap, and a little vinegar. The dish soap and vinegar mixture is great for getting most of the greasy spots off of the walls. For harder-to-clean greasy spots, I like to use a specialized grease remover. You may need a ladder if you are short like me, but make sure to wipe down all the walls. If you feel so inclined, you can pull the fridge and stove out and wipe the walls behind those, as well, or do it when you get around to cleaning those appliances. Cabinets: You can tackle this step at the same time that you wash the walls, but you can save this for later, or for a different day. Using a degreaser (even dish soap and vinegar mixture works well), wash down the outsides, the insides and all around your cabinets. I tend to do the upper cabinets when I do the walls, and do the lowers when I do the counter tops. It breaks up the job, and I have less work to do over. Clean the Counters: This does not mean simply wipe them down, like you do every other day. 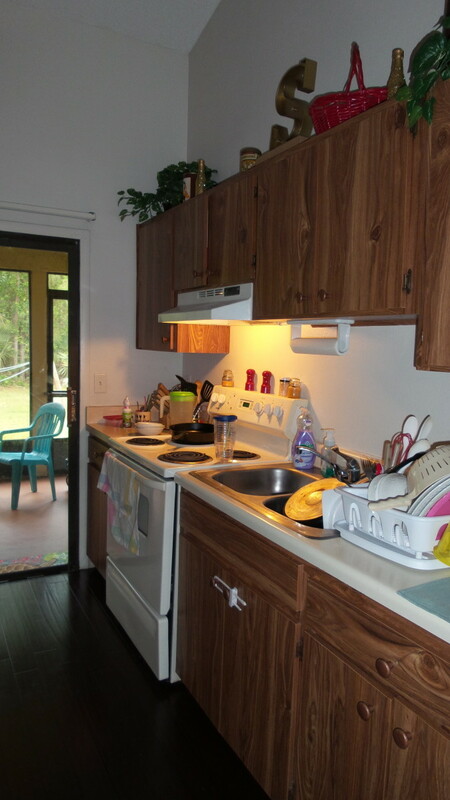 Start with one counter at a time, remove all the appliances, etc., from the counter and wipe the counters down well. Make sure to get into all the crevices and corners. I use an old toothbrush for this. Scrub any stains that have accumulated, and clean all of the appliances and whatnot before returning them to the counter. Clear the crumbs out of the toaster, wipe down your knife block, wipe down your canisters, etc. Clean Large Appliances: Obviously, you can't pull these out when you clean the counters. Tackle each appliance individually, but make sure to make the most of your time. Spray on the oven cleaner (which, generally, has to sit for a bit), and clean the outside, sides, top and bottom of your stove while the oven cleaner does its work. Pull the appliances out from the wall and clean behind and underneath. Clean the fridge and freezer inside and out. A great tip for cleaning your microwave is to put a small bowl of equal parts water and vinegar into the microwave and run it on high for 2-3 minutes. The mixture will evaporate and loosen all the crud in your microwave. Be sure to dust the coils of your refrigerator. This is also a good time to inspect cords, gas lines, and water lines that are hooked up to your appliances. Replace damaged items. Clean Floors: Yes, we all mop our floors regularly. That is not what I am talking about here. Wipe baseboards, if you didn't do this when you wiped down the walls. Scrub the floors by hand. If you have wood floors, be sure to have a drying towel handy, as well. Use an appropriate cleaner for your flooring material. Clean grout, if you have tile. Vinegar and baking soda is great for cleaning grout. Reseal your grout after you clean it. Tackle each bathroom individually, or do them simultaneously. It's up to you. I tend to work on each one separately. I clean one one day, and the other the next. Address the clutter, first and foremost! Throw out makeup that is past its prime, toss expired medications, etc. Dust the Ceiling: Sweep the ceilings with your broom, if you haven't done so already. As I said, I tend to do the ceiling dusting all at once, through the whole house. Wipe the Walls: Again, wipe down the walls with a mixture of warm vinegar and dish soap. Skip the tile, for now. 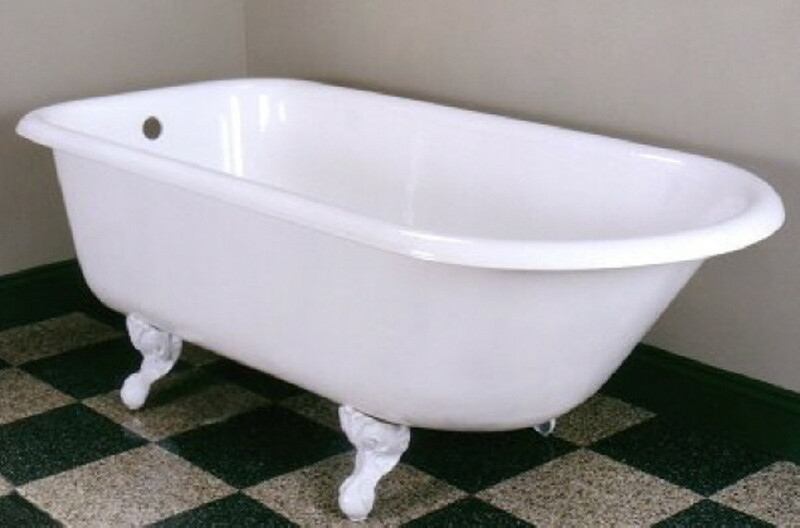 Scrub the Tub: Use a good quality product for removing soap scum, and scrub your shower and tub. 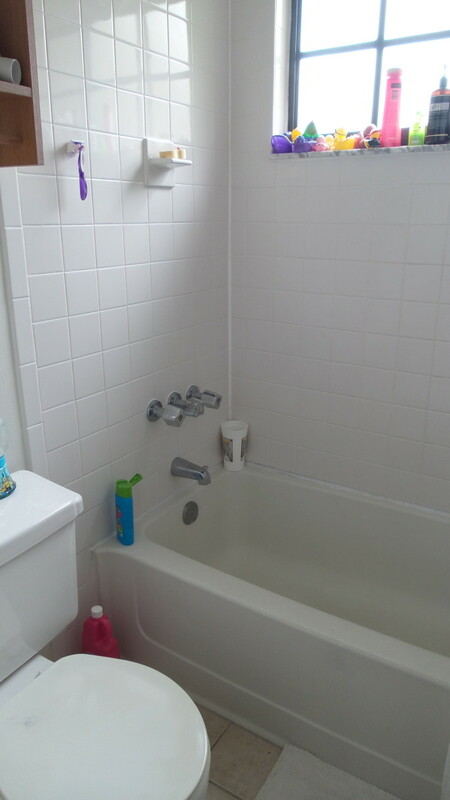 Re-caulk the shower as necessary, clean the grout (if you have it) and descale the shower head. 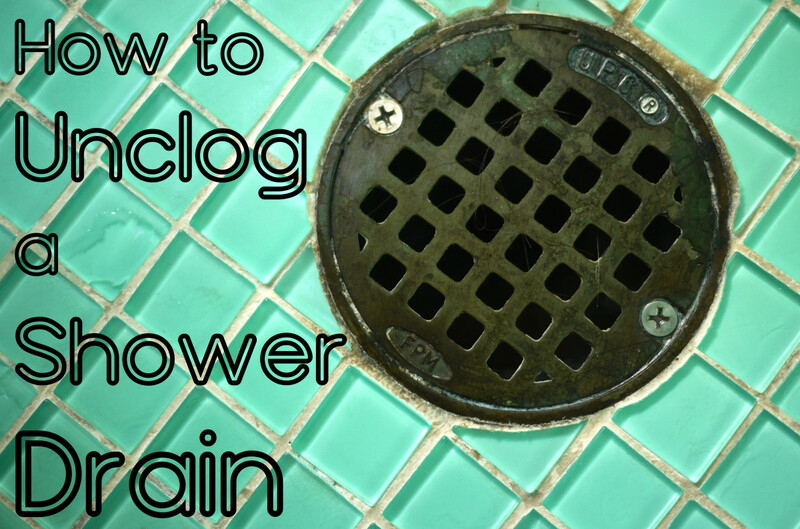 A great way to do this, is to remove the shower head, soak it in warm vinegar for a few hours, and then rinse it well before putting it back up. Replace Teflon pipe tape if need be. Tackle the Toilet: If you are like me, you clean the toilet quite often, so this won't be a huge deal. Wipe down the lid to the tank, check the mechanisms inside the tank to make sure they are working properly. Scrub the whole toilet, inside and out. Be sure to clean at the base of the toilet, as dust tends to settle there. Put a bleach tab in your tank, if you so choose to. Mirrors, Fixtures, and Vanity: I put this all in one group, as I tend to address all of them at the same time. Dust your light fixtures, take the shades off, and wash them. Dust on top of your medicine cabinet (if you have one), and your mirrors. Scrub the sink, being sure to get in the crevices around your faucets. 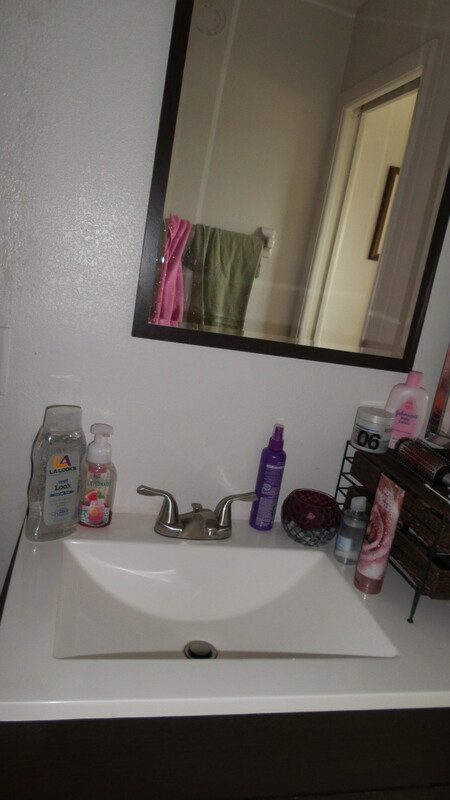 Wipe down the vanity, just as you would the cabinets in your kitchen, including inside the cabinets and drawers. Re-caulk around sink if need be. Scrub the Floors: Scrub the floors by hand, as you can get in all the corners much better than you could with a mop. Be sure to get around and behind your toilet. Clean and reseal the grout. Your bedroom should be your sanctuary, not the dumping ground for all your clutter. Sadly, this is what my bedroom has become. It is part office, part bedroom, part junk collector. 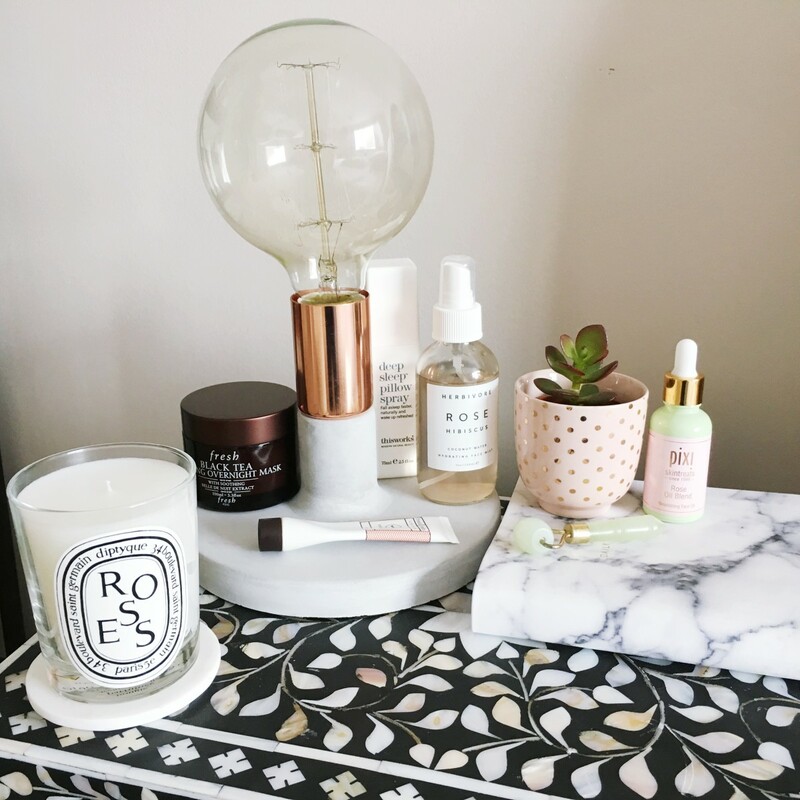 Clear Clutter: This is something I have already covered, but because the bedroom often becomes an over cluttered nightmare, it's best to reiterate it. Get rid of clothes you never wear, pack up those winter clothes, put that pile of change into a container (or take it to the bank), and just clear the clutter from the room. Ceilings and Walls: Here we are again with the ceilings and walls. Address these, if you haven't done so already. Follow the steps above. Wipe down ceiling-mounted light fixtures at this time, as well. Dust and Polish Furniture: Now that the clutter is gone from your dresser and nightstand, you can easily dust the furniture. Get in to all the little areas you don't normally get to. Pull out the dresser and dust the back, move things around and dust underneath, wipe down lampshades, etc. Then, if need be, give your wood furniture a treatment with a wood conditioner. Wicker furniture also needs special attention, because wicker tends to dry out and fall apart. Use a vacuum to clean the wicker furniture, and use a soft brush and soapy water to clean the wicker. Allow to air dry in the sun. Unpainted wicker should be treated with some linseed oil applied with a soft rag. Linens and Curtains: Take down your curtains, dust your blinds, and remove bed linens, including your often forgotten about bed skirt. Wash them all. Certain curtains cannot be washed in a machine, or must be dry cleaned. Follow appropriate cleaning methods for your window treatments. A simple trick for cleaning blinds is to either get one of those dusters designed for cleaning blinds, or get creative, take two old kids socks, preferably ones that are a little fluffy, and place them over a pair of kitchen tongs. 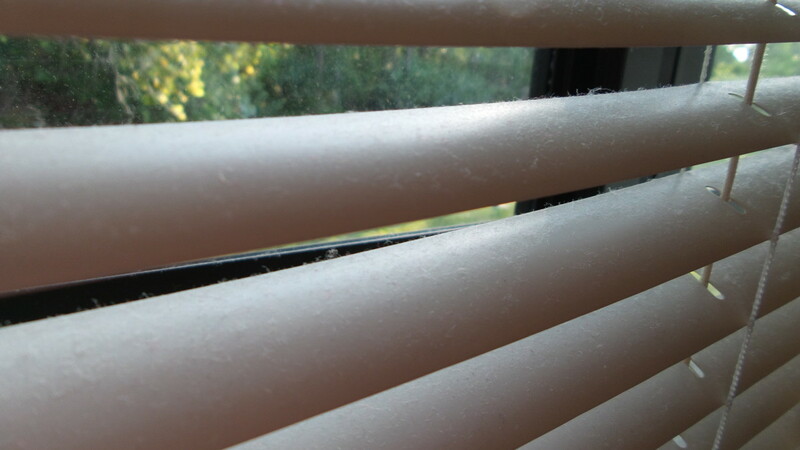 Blinds can also be taken down and cleaned with a mixture of dish soap and vinegar to remove dust, spots, and other grime. Mattress: While you have the linens off of your bed, be sure to give your mattress a cleaning. This can be done through a service, or if you feel like handling it yourself, just vacuum the mattress, sprinkle it with baking soda, let sit, and vacuum again. 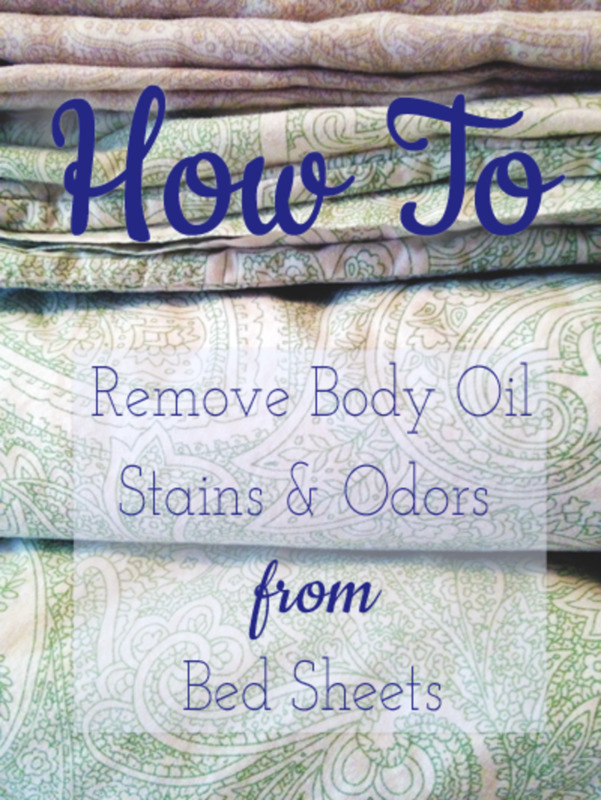 Follow this up with by lightly spraying the mattress with vinegar. I promise your mattress will not smell like a salad. The vinegar has disinfecting properties, and also deodorizes the mattress. Allow the mattress to dry thoroughly before placing clean linens on the bed. You can also take this time to clean your pillows. Floors: Follow appropriate steps for cleaning the type of flooring you have in your bedrooms. Be sure to also clean any rugs that are on your floor; vacuum them, wash them, and be sure that they are completely dry before returning them to your floors. 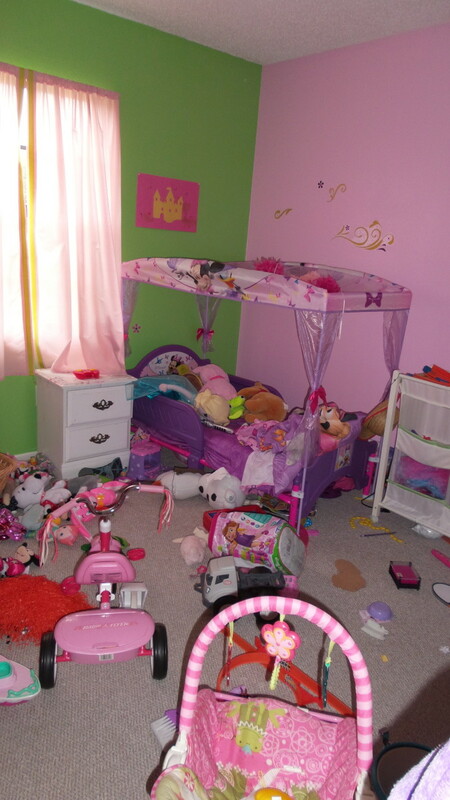 This is the room where most of the family spends their time, so it can get pretty messy. General cleaning takes care of most of the problems, but a good clear through is needed from time to time. Enlist the help of the kids to tackle the clutter, and when that is done, get to cleaning. 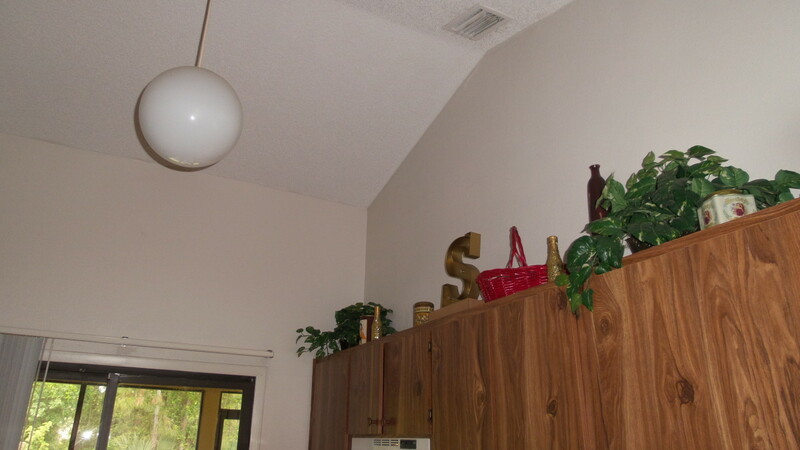 Ceilings and Walls: Yep, same as before. Dust the ceilings and wipe down the walls. Be sure to clean overhead light fixtures and ceiling fans, as well. Dust Hard Surfaces: Be sure to dust all hard surfaces, including moving them away from walls, dusting underneath (you would be surprised where spiders like to hide), and dust lampshades. Treat wood furniture if need be. Soft Surfaces: Here, we are talking about couches, pillows, throw blankets, and that sort of thing. Wash the blankets and pillows. Have the upholstery cleaned, or shampoo it yourself, if you can. Check pillows for tears, mend them or toss them out. Check couch for tears, and have repaired. Entertainment Area: An often neglected area is our entertainment area. We usually dust the shelves, the television and that sort of thing, but go a little further. Wipe down the cords with a slightly damp rag, to get rid of dust. Vacuum the vents on the television, the cable box, etc. Wipe down controllers, remotes, etc. with a very slightly damp cloth. You do not want moisture getting into the components. Remove books, video games, etc. and dust underneath. 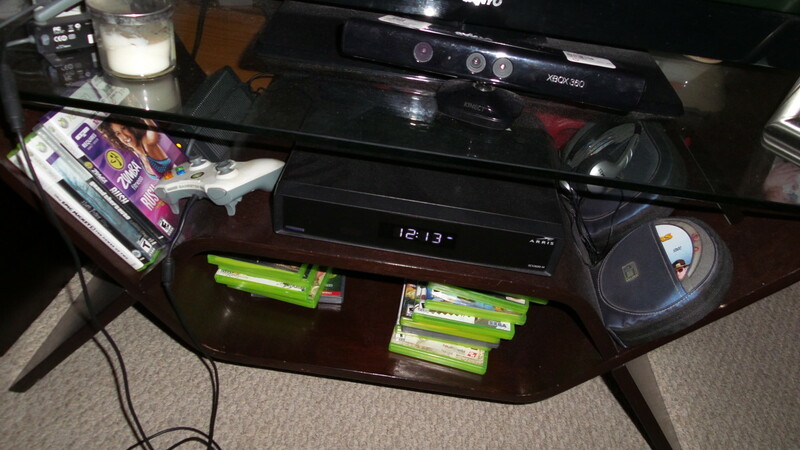 Dust the items before returning them to the shelves. Tidy up the cords with twist ties or zip ties to keep everything looking neat and tidy, or invest in a cord keeper. It's basically a tube that is slit down the side. You place the cords inside, and it keeps them together, and looking neat. Floors: Use the appropriate products for cleaning the type of flooring you have in your living room or family room. Treat carpet stains before shampooing. Re-seal grout, if you have it. Closets are the bane of my existence. I never have enough storage space, and I have way too much stuff. So, for starters, go through each closet individually. It's an easier task if you work on one closet at a time. If the closet is in one of your kid's rooms, get their help. Go Through Everything: Set up four piles. A 'keep' pile, a 'donate' pile, a 'seasonal' pile, and a 'trash' pile. 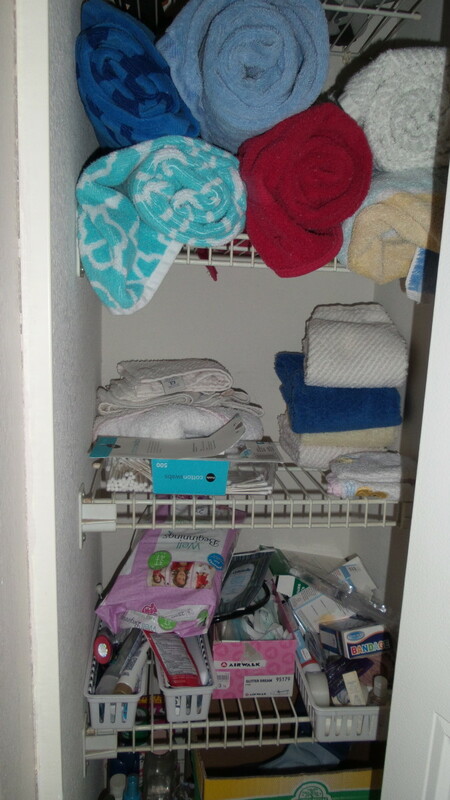 If it's easier, use bins or baskets for the various categories. As you pull things out of the closet, decide which pile it goes into. Donate clothes that no longer fit, or that you no longer wear. A great tip for making this easier is after Spring cleaning, put all your clothes on the hangers, and hang the hangers up facing the wrong way, when you wear something, turn the hanger around. 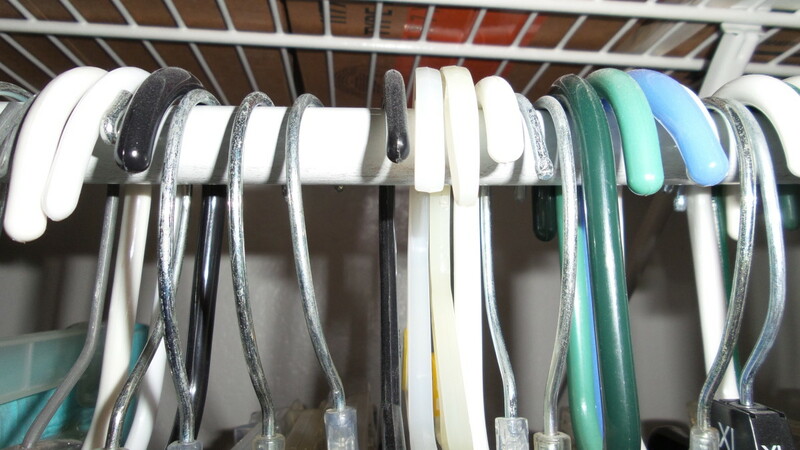 Once Spring cleaning rolls around again, get rid of anything that is on a wrong facing hanger. This does not apply to special occasion items, like suits or gowns that you would like to keep for special occasions. Go through the stuff cluttered on the shelves, and even your shoes. The same thing can be done with shoes. Turn them backwards, and when you wear a pair, turn it forwards. Get rid of any shoes still facing backwards. Be Firm: Especially dealing with kids. Throw out anything broken, or games with missing pieces. Get rid of clothes they don't wear, or that no longer fit. Be firm with yourself, as well. Yes, that cute top that was trendy five years ago is still cute, but are you really ever going to wear it again? You got a great deal on a pair of shoes, but you never wear them because they hurt your feet. Get rid of anything that does not make you happy. Clear the Piles: Go through the 'garbage' pile, to make sure nothing was thrown in there by mistake, and throw it all out. Go through the 'donate' pile, and pack the clothes in one box, shoes in another, and so on. Take all of it to a donation center as soon as you can. If it sits there too long, you may change your mind. Get your kids to go with you, so they can be a part of it. Pack away the 'seasonal' pile (winter coats, sweaters, etc). Set aside the 'keep' pile until you have cleaned the closet. Clean It: Dust the walls and ceilings of the closet, to clear out cobwebs and dust. Dust the shelves and the top of the clothes bar. Clean the floor of the closet; vacuum it and shampoo it if it is carpet, or wipe down if it is tile, wood, etc. 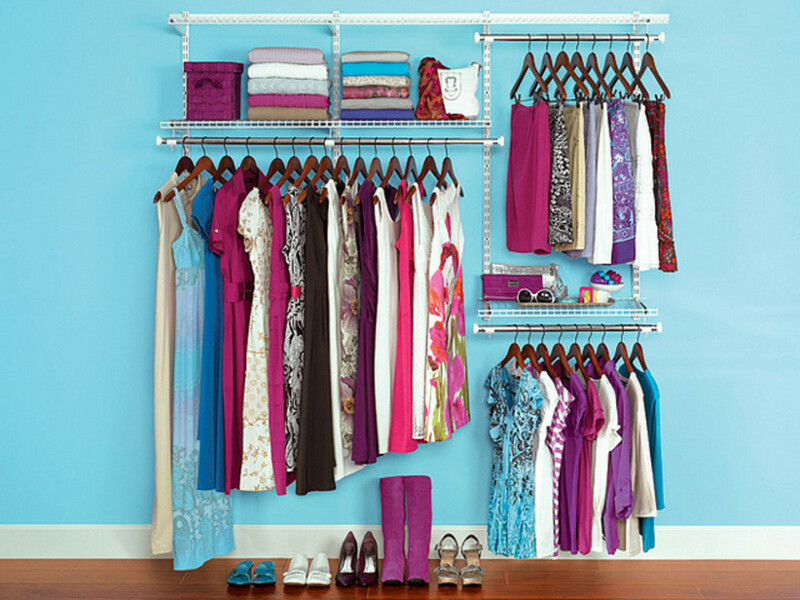 Organize It: As you put everything back, hang the clothes up with the hangers on backwards, like I talked about above. It will make the process easier next year. Group like items together, and put everything back in an organized manner that you feel will be easy to keep up with. Special occasion items, like suits and gowns, should be covered with dry cleaning bags to keep them clean and dust free. Other areas of your home are often forgotten about when it comes to Spring Cleaning. Those areas include your garage, porch, the outside of your house, and your yard. These are all important. The garage is often a dumping ground, full of seasonal decorations, yard equipment, and other things. Our garage is a giant mess. It's almost too daunting a task to tackle alone. I suggest enlisting some help for this one, especially if there is some heavy lifting involved. 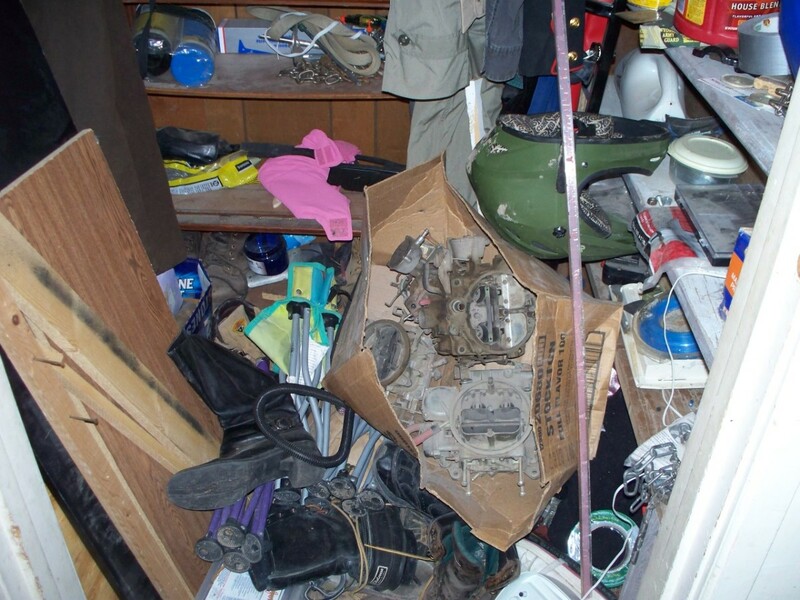 Go through the garage, as you would any area, and make piles like you did with the rest of the house. Discard broken items and empty boxes. Donate those items you no longer need, or hold a garage sale. Pull everything out of your garage, and give it a thorough cleaning. 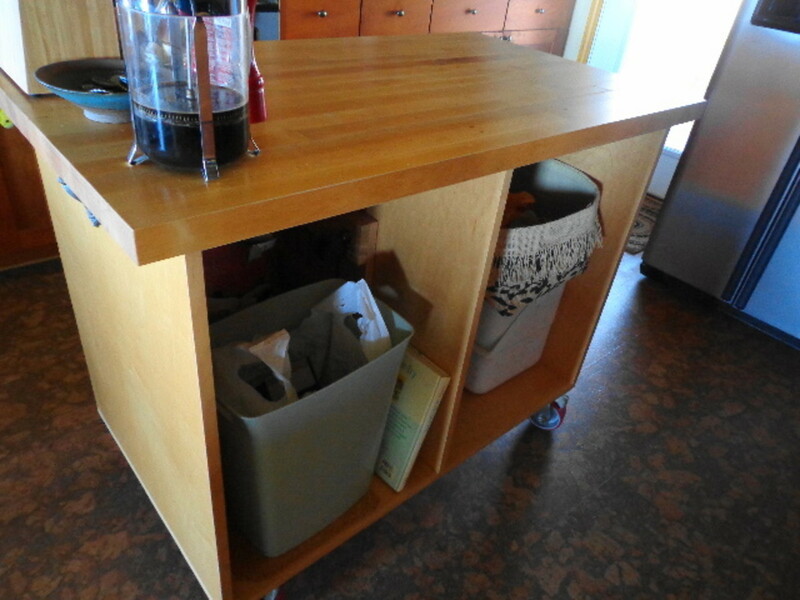 Sweep away the cobwebs, sweep the floor, and reorganize everything before you put it back. No need to scrub it, after all, it's a garage. If your washer and dryer happen to be in the garage, give them a wipe down, check plumbing lines, hoses, and that sort of thing. 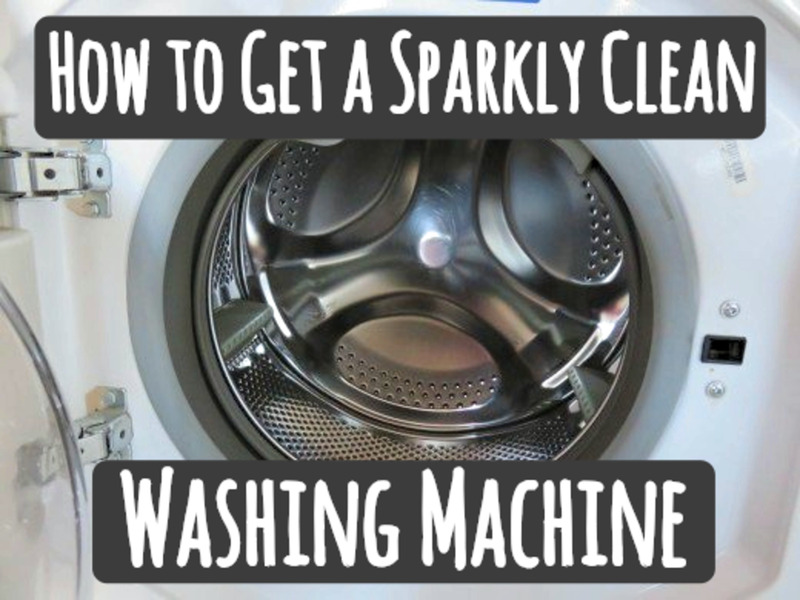 Wash your lint trap in some dish soap to clear away the residue left by the dryer sheets. Quick and easy, garage is done. I have a screened in back porch, and a small front porch on my house. The back porch tends to collect toys. I have no idea why...of course I do, but that's another issue. Go through the things on your porch, decide what needs to be there, what is still being used, and get rid of the things that no longer serve a purpose. Sweep away the cobwebs, and give everything a quick wipedown. That pretty much covers it. Check your furniture and your grill, and make sure everything is in working order, and that nothing is broken. Make repairs as needed. If you have fabric cushions on your furniture, give them a cleaning following care instructions, or replace them if need be. The front porch is a simple matter of sweeping away the cobwebs, checking the porch light, and making sure anything on the porch is in good shape. I don't have much on my front porch, but you may have chairs or a bench. Make sure they are in good shape, and give them a thorough cleaning. Clean the porch light of any bugs, dirt, or spiderwebs. Most people don't think of the outside of their house when they are doing spring cleaning, but the outside needs attention just as much as the inside. This might require a little more elbow grease, or the help of skilled professionals, but it needs to be addressed. Check windows and doors, clean windows from the outside, pressure wash the exterior, including the driveway and sidewalks. Check the paint, and check for damages to the exterior. Fix what needs fixing. Like I said, this may involve hiring skilled professionals. The yard is a simple task. Clear away any debris that has accumulated, like fallen branches, pine cones, leftover leaves from the fall, and that sort of thing. Edge the lawn around the driveway and sidewalks. Pull weeds, put down mulch and fertilize the lawn and plants. That's it. I wish my house were clean. I have a small child, and she makes enough of a mess for about five people. It's clean, but not tidy. Your house sounds so much cleaner than mine, but in the scheme of things, I'd rather be outside with wildlife. You do make it sound relatively painless, though. I tend to have the same problem. I just started my Spring Cleaning. I have tossed out about 4 bags of stuff, and I have barely made a dent. Ceilings are done, too. Just take it one step at a time, and even if you can't get it all, even a little of it is a good idea. You spell out a solid plan, but wow--that's a lot of work! I haven't spring-cleaned in years--or ever! It's all I can do to keep the dishes done. LOL. Good job on this hub! Very thorough! Thank you so much...now I just need to do the cleaning part. Thank you!! I am working on adding a bit to it. Polishing it up, and adding a few more pictures. Wow ! 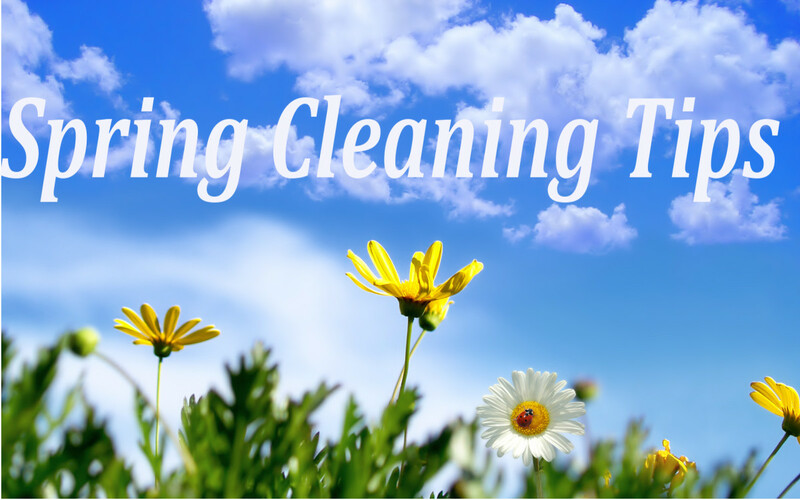 Nice tips on spring - cleaning. You covered all the details. Great hub. Comprehensive, but very useful. Thanks for the nudge!